The coastal port city of Visakhapatnam looks both outwards to the sea and inland to the mountains of the Eastern Ghats. Kick off your visit on the 6th (Sun): take in the dramatic scenery at Kothapally Waterfalls and then contemplate in the serene atmosphere at Varahalakshminarashima Temple. On the next day, take in the spiritual surroundings of Kotilingeshwara Temple, take in the spiritual surroundings of Sri Bhadrakali Sametha Veereswara swamy Devasthanam, then contemplate in the serene atmosphere at Sri Lakshmi Narsimhaswamyvari Devastham, then Head underground at Borra Caves, and finally take in the spiritual surroundings of Lakshmi Devi Temple. For traveler tips, photos, reviews, and more tourist information, go to the Visakhapatnam trip itinerary website . New Delhi to Visakhapatnam is an approximately 4-hour flight. You can also drive; or take a train. Finish your sightseeing early on the 7th (Mon) so you can travel to Tegalalang. The most famous Tegalalang tourist attractions are rice terraces, forming a landscape you'll be hard-pressed to find elsewhere in the world. Start off your visit on the 8th (Tue): look for all kinds of wild species at Elephant Safari Park, then steep yourself in history at Mengening Temple, and then take in the spiritual surroundings of Tirta Empul Temple. To find maps, other places to visit, reviews, and tourist information, read our Tegalalang planning site . Explore your travel options from Visakhapatnam to Tegalalang with the Route module. The time zone difference when traveling from Visakhapatnam to Tegalalang is 2 hours. Expect a daytime high around 36°C in January, and nighttime lows around 28°C. Finish up your sightseeing early on the 8th (Tue) so you can travel to Denpasar. Explore Denpasar's surroundings by going to Ubud (Sacred Monkey Forest Sanctuary, Threads of Life, & more) and Tanah Lot Temple (in Beraban). Spend the 12th (Sat) among aquatic life with a scuba or snorkeling tour. 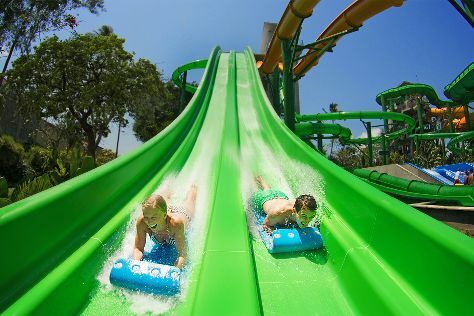 The adventure continues: make a splash at Waterbom Bali, relax and float downstream with a rafting and tubing tour, test your problem-solving skills at popular escape rooms, and get outside with SeaBali. To find more things to do, traveler tips, maps, and tourist information, read our Denpasar attractions planner. Drive from Tegalalang to Denpasar in 1.5 hours. In January in Denpasar, expect temperatures between 36°C during the day and 28°C at night. Wrap up your sightseeing on the 12th (Sat) early enough to travel back home.